To get started on forms, see Best practice in forms design: a round-up. Or go to the full list of my publications and presentations on forms. I have been helping organisations to make better forms for more than 20 years. 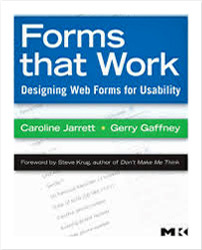 My book is Forms that work: designing web forms for usability. • support you in testing to make your forms as effective as possible. 1. Forms studio: in a single day’s visit I can usually give you an action plan to tackle your forms. Usability evaluations take a little longer, but can always fit around your timetable. 2. Tailoring an approach: contact me to discuss how I can help improve your forms.